All inside spaces are SOLD OUT. Outside spots are still available. If you want to be on a waitlist for spots inside a barn, complete an application and select “Waitlist Barn 3” or “Waitlist Barn 4”. No payment required. In 2019 Barn 1 will no longer include vendors (demos and other educational exhibits only) but we are providing outside vending spaces along the north side of Barns 2, 3 and 4. You will need to bring your own tents for the outside spaces. Only payment via PayPal will be accepted (you may request a PayPal invoice if you do not have a PayPal account) as we move to a fully electronic submission process this year. The application is an online form. Maximum vendor space is 10 x 30 so we can provide Festival Attendees with a wide variety of vendors. Vendors wishing to display large animals (alpaca, llama, yak, etc. – NOT sheep as they are shown in the Breed Display) as part of their exhibit may have an free 10×10 space for the animals if the vendor provides health papers, proof of rabies vaccination at least 2 weeks prior to the Festival and a pen with water and bedding. Vendors wishing to include a large animal display please request animal space on your application (you will be located in Barn 3). Please note that camping is for vendors only. Terms and Conditions (including details of site/ general vending information). Spaces for vendors who have participated in the Festival for multiple years and GSSB members who have indicated they will vend in 2019 will have their prior locations held/reserved until Jan. 31, 2019. At that time if payment has not been received, their spot will be released. Since the GSSB seeks to encourage local (NJ, eastern PA, southern NY) farmers and handcraft artisans working with fiber, we will give priority to new vendors meeting this description up until May 31, 2019. At that time if there are still open spots, we will fill spaces with other vendors. 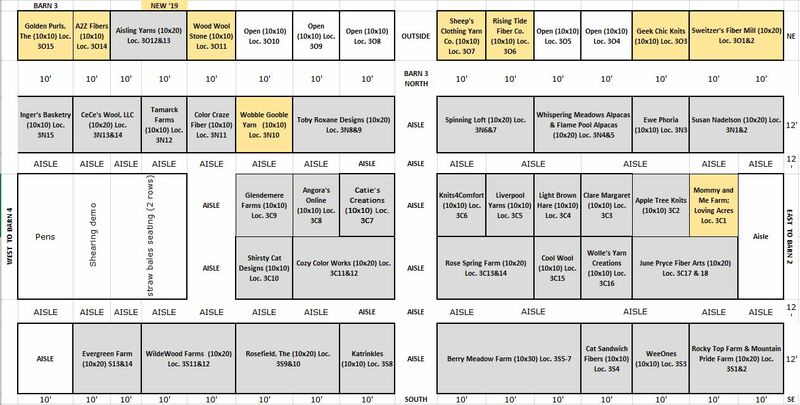 The 2018 Vendor list with links to 2018 barn layouts are available on this web page. Other questions? Contact Andrea at gardenstatesheepbreeders@gmail.com. You will be notified via email of payment/ acceptance/ assigned location within 2 weeks of application receipt.